Having a conversation comes naturally when you’re training clients in person, but what about online personal training? Building rapport is a little bit trickier through email. Answers need to be explicit and factual – there’s no room for interpretation or ambiguity. Something said with a wink and a nudge in real life could drastically impact a workout regime if you misread a joke or didn’t see a client smile as they answered. It’s important to gather as much (boring) information about your client on Day 1 so you can process it, act accordingly, and move on to the more rewarding tasks. What’s the best way to get this information? Ask for it. 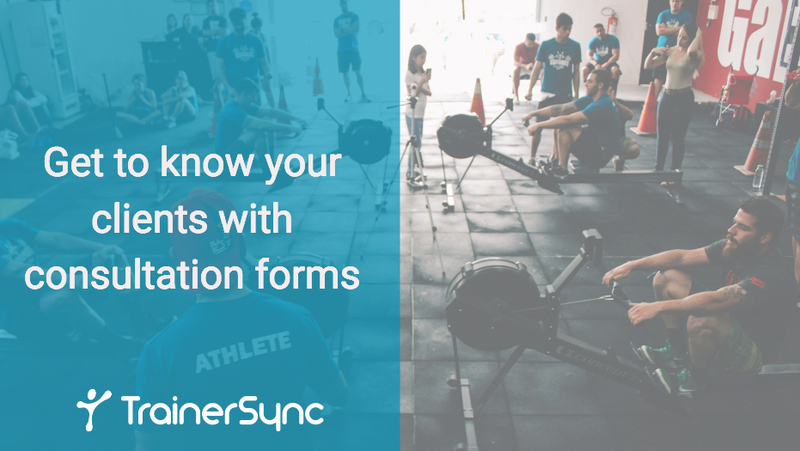 TrainerSync provides a fully customisable Form Builder so you can get the answers you need quickly and efficiently. Simply build your initial assessment questionnaire using our personal trainer software, store it online, and automatically send it to clients when they sign up for your training programme. And if you don’t want to recreate your forms in TrainerSync, we’ve also included a handy document storage area so you can just upload your PDF or Word documents and share them with your clients directly from the app. Your initial consultation probably lasts 60 minutes. You might even offer a free consultation session to start with, which is fine, but once you’ve spent 20 minutes talking to your client about high school injuries and Big Mac urges you’ve only got 40 minutes left to impress, convert, and book them in for some paid sessions. Personal training is a service business. Typically, clients will get in touch for a session rather than just turn up at your gym and demand you train them. It’s not a barbershop. When you speak to a potential client on the phone make sure you get their email address. As soon as they hang send them an email with your initial consultation form attached. Tell them to fill it in and send it back ASAP, before your first session, otherwise you can’t train them. If you know exactly what your clients goals are, what their injuries are, what their lifestyle choices are, you’ll be prepared for your first session days in advance. You know what they want, and you know what you have to do to help them. Remember that 20 minutes you used to spend talking about your client’s work, social, and family life? You can drop that to 10 minutes. You know the important taking points. You’ve got the answers written down in front of you. Cover the essentials, show your client you understand their history and goals, and get on with your training. Remember, clients are paying for time as well as expertise. Give them both. Sending professional forms to clients ahead of their session helps you establish yourself as a professional. You’re not here to wing it. You’re serious business. Get some nice forms written up. Google Documents is great and has a load of templates you can choose from. Alternatively, send and receive forms using online personal trainer software like TrainerSync. Then, once they turn up to the gym you’ll have tailored workout session waiting for them. Most initial consultation forms cover the basics: age, height, weight, medical history, etc. But there’s so many aspects to a new client’s health that might affect their ability to exercise or eat healthily. Knowing they’re overweight is one thing. Knowing why is another. There are so many aspects to a client’s life that affects their fitness, and ability to exercise. The more you know, the better you can help them take control of their health. But you don’t want to dive too deep just yet. How many hours/days per week do you work? How many alcoholic drinks do you drink per week?